“Yeah, it’s a crazy story!” said Tom Hewitt in an email. Tom is the founder of Surfers Not Street Children, a non-profit out of Durban South Africa that has been instrumental in raising awareness of and trying to find a solution to a phenomenon called street children, or youth that live on the streets. South Africa, like many developing countries, deals with elevated levels of homelessness among youth. Kids end up living on the streets, often resorting to lives of crime and drugs as a result. Surfers Not Street Children, as Tom has explained to me before, lends these kids surf equipment and gets them so fired up to surf that negative outlets often fall by the wayside. “Basically, we’ve been looking to expand into Mozambique for a while. We’ve been planning a chapter in Tofo (think epic point breaks, warm water and heaps of local need among a cool, vibrant community). I’ve been visiting Tofo to surf since just after the civil war. “Anyway, last year, as you know Kelly featured us in his video Continuance Part 2 (by Alek Parker). It was so rad for us as it really put a spotlight on our work. Surfers Not Street Children opened Tofo Surf Club on May 10th – it combines mentorship and coaching to develop kids’ surfing talent and inspire them. All the club’s staff are locals including Mini Cho (19), one of Mozambique’s best surfers, and his brother Junior (12). Both serve as role models to the kids at Tofo Surf Club. 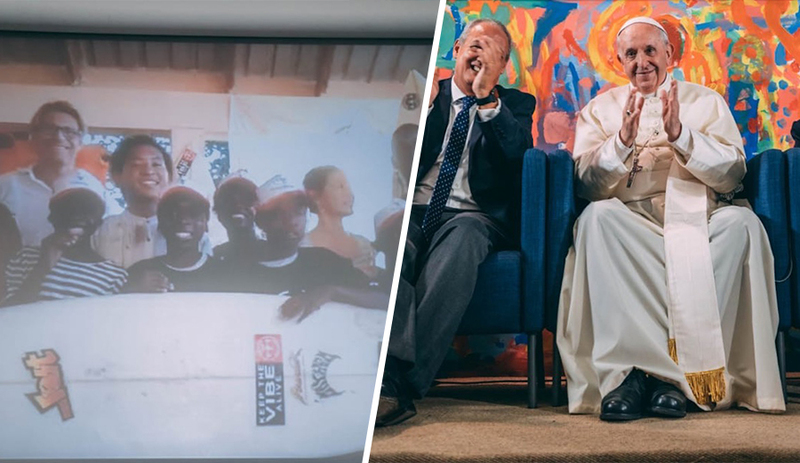 To commemorate Tofo Surf Club’s launch, the rest of the crew spoke to Pope Francis over Skype, who blessed the project. The Gudauskas’ brothers’ also ran a board drive late last year to support Surfers Not Street Children, some of which are now in the hands of Tofo Surf Club surfers. How’s that for a feel-good story?